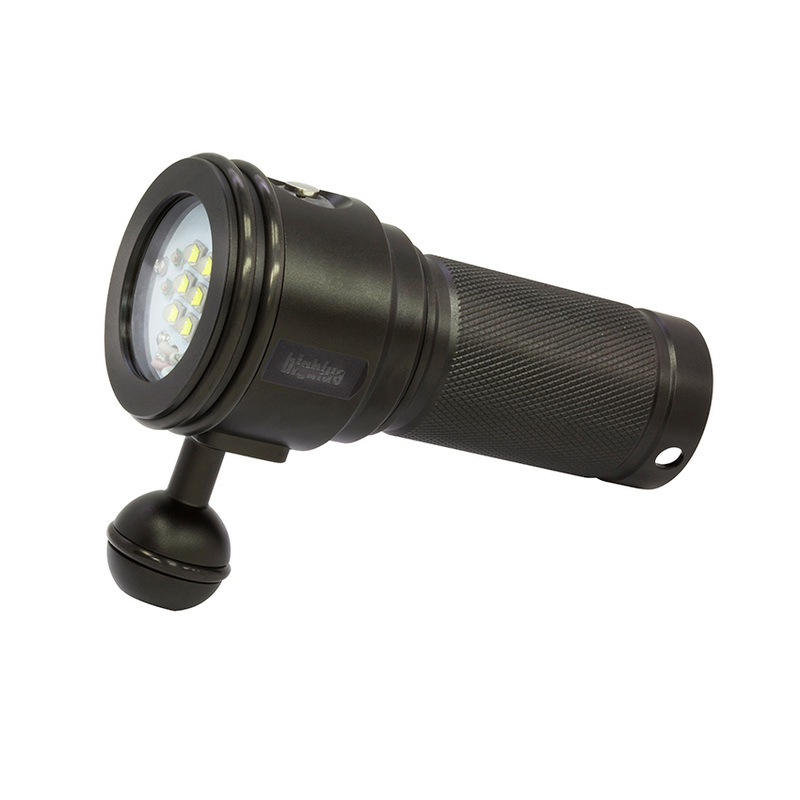 A very powerful output 900 lumens in an 10° light beam such as lightning in the silent sky. A low cost video light with 120° wide angle of light beam, the light comes with red filter; yellow filter and clip for easy system setup. 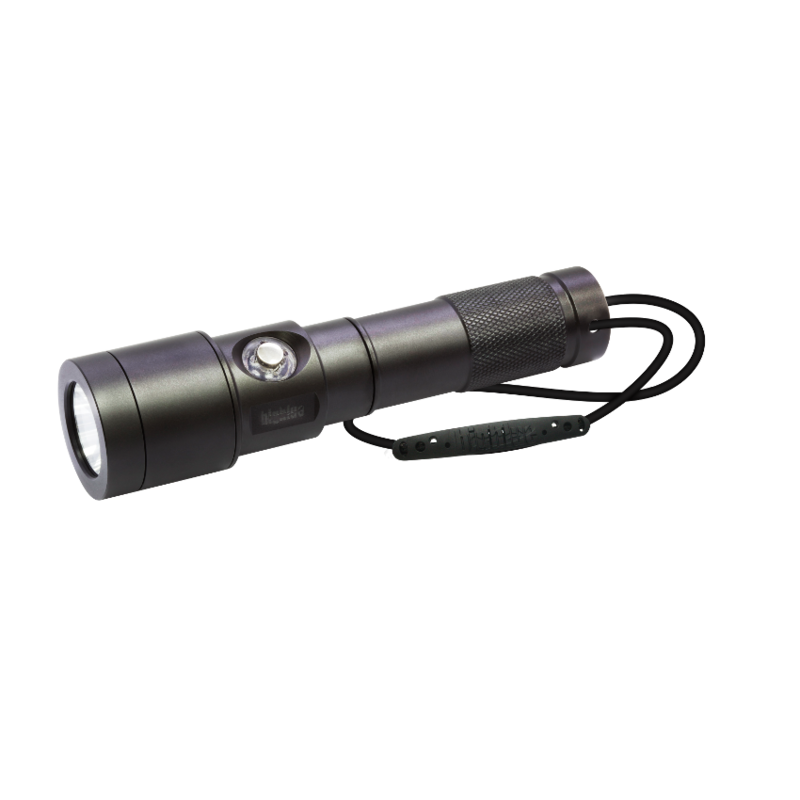 This self-contained tech-light pumps out 2800 lumens in a very compact body with the reliable push button with battery indicator; it allows you to choose 4 levels of brightness and SOS function. VL 2800P is the new member of out video light family. 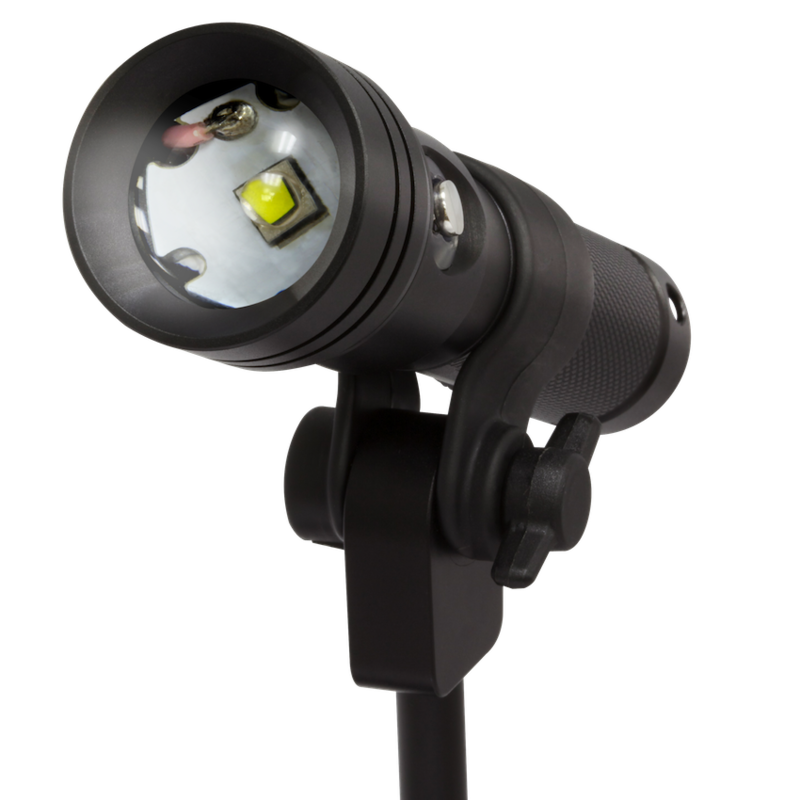 It is a self-contained, compact and powerful all-purpose diving light best suited for video light. 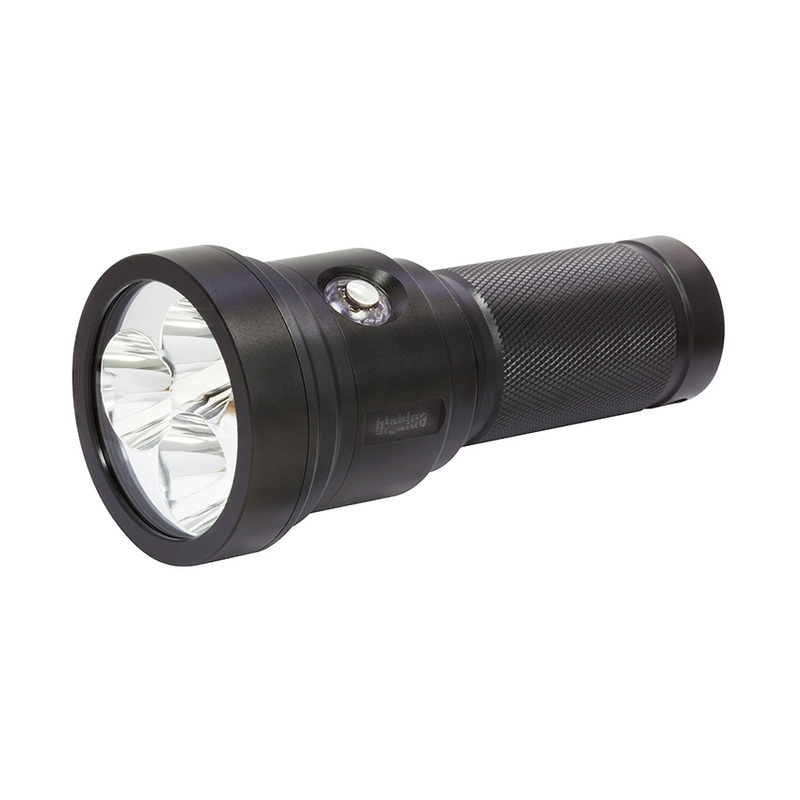 It generates 2800 Lumens and offers 10%, 25%, 50% and 100% output levels through the reliable push button. 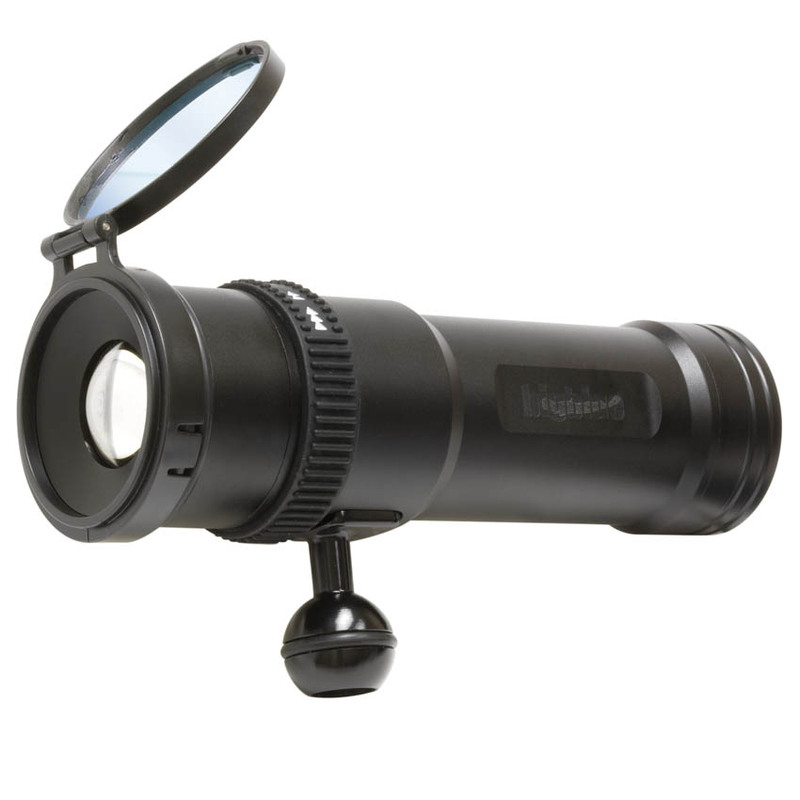 This light is also built-in red colour mode for viewing shy little creatures and enhancing focusing performance. New for 2014! 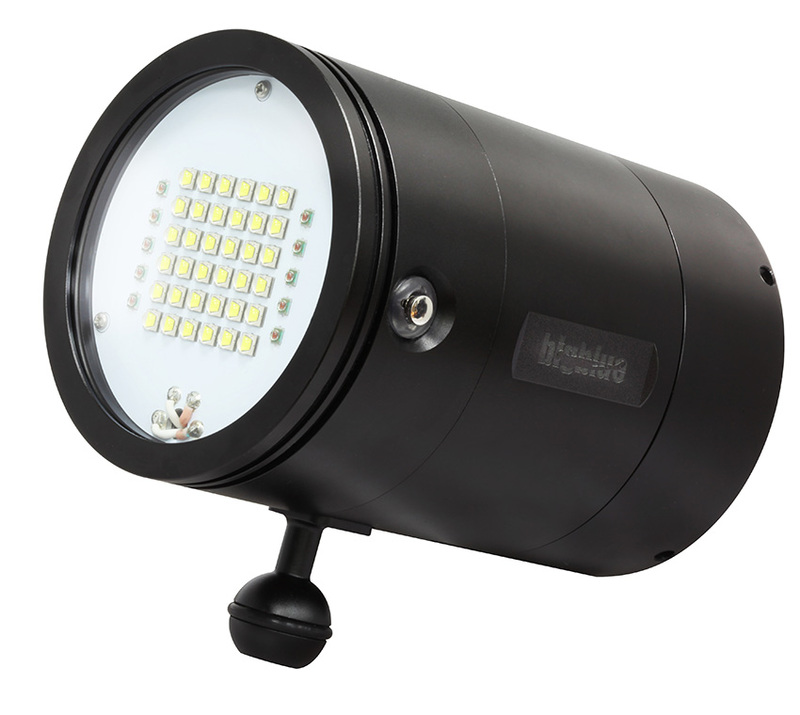 A 2800 lumens wide beam video light with dual spot and flood beam mode, even built-in red colour mode. At flood beam mode, it provides 120° wide beam. At spot beam mode, it provides 10° narrow beam. Never in the history of underwater photography has a light this size and weight produced such amount of light without external battery pack. 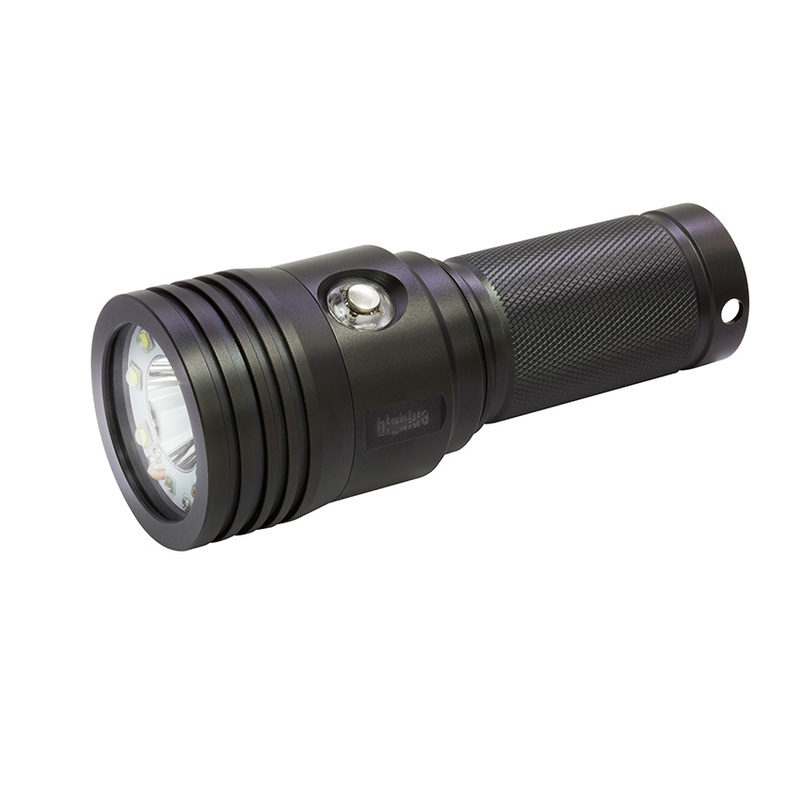 Light source 1 x Cree LED Light output 750 Lm (Hi). 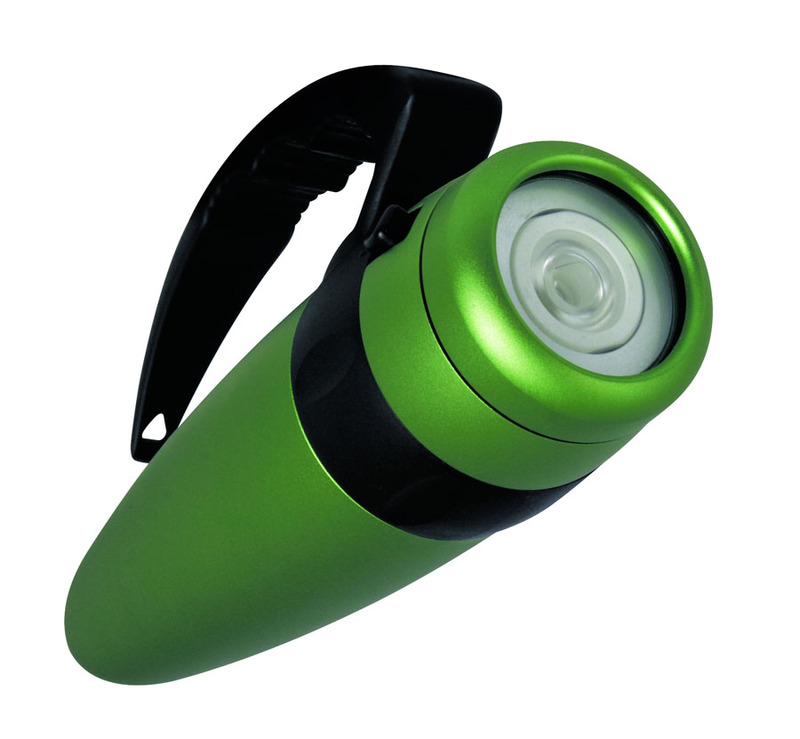 A powerful output in an 8° light beam, it cuts the murky water like a razor, using only 3 x AAA batteries. 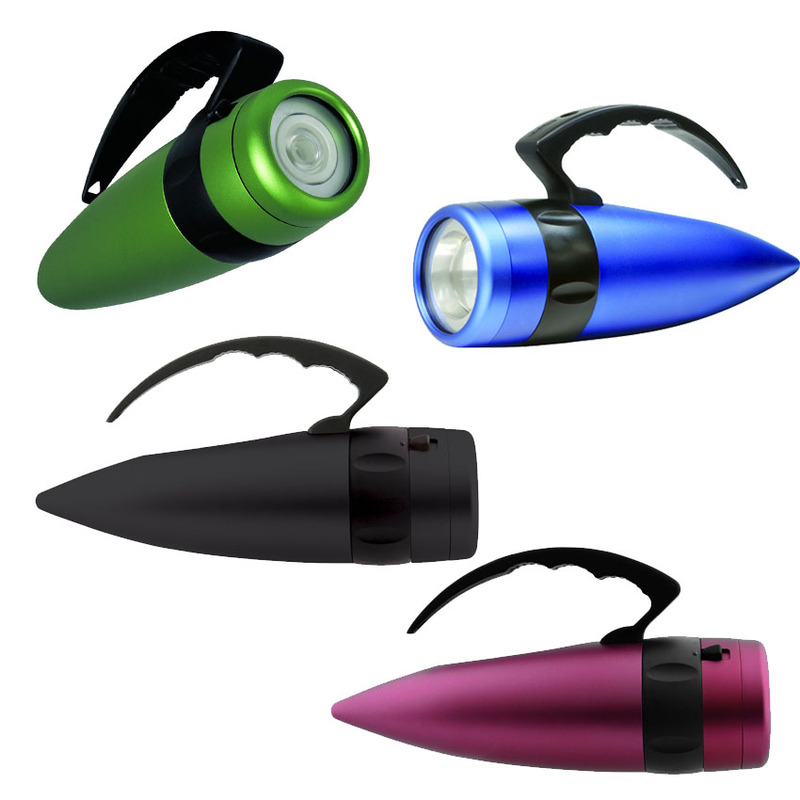 Full aluminium body for the rugged needs, you can twist it on/off easily. Casing material Aluminum alloy. Anti-corrosive anodized. 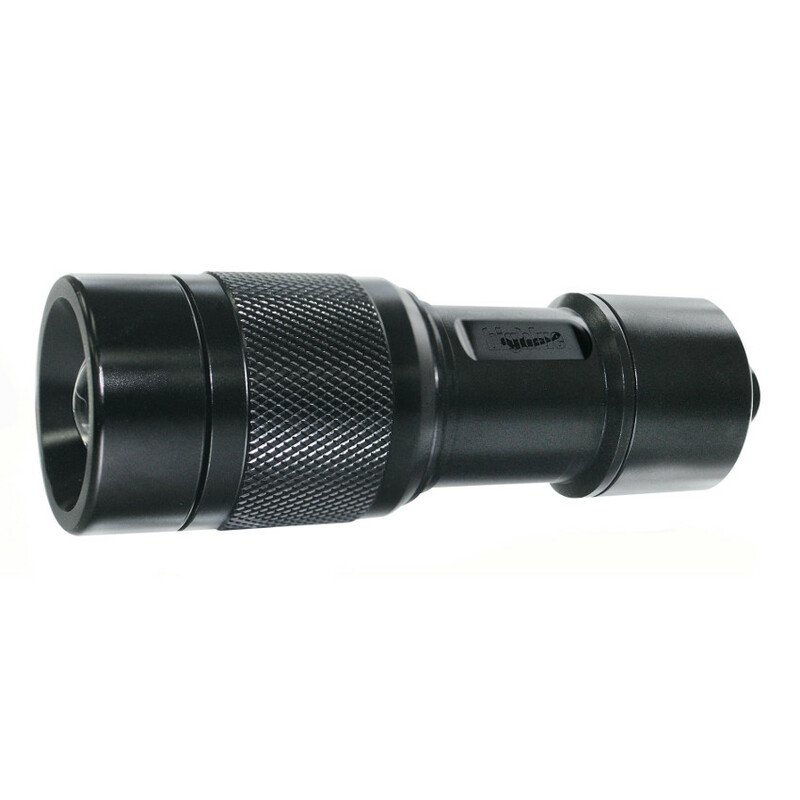 Light source 4 x Cree LED Light output 750 Lm (Hi). AFO Interval 1 sec. +/- 0.3 sec. 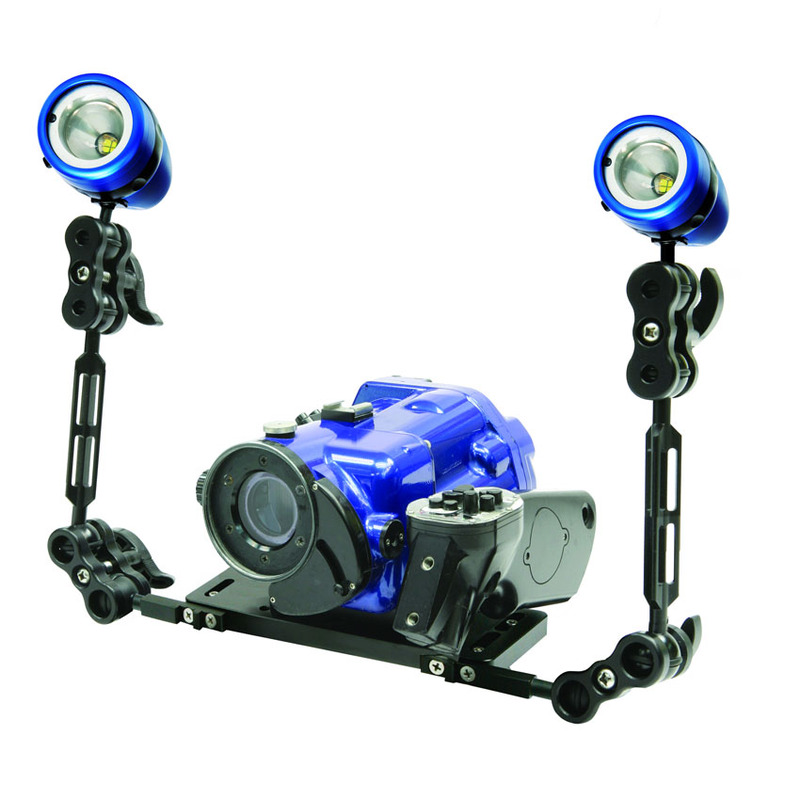 Rugged, reliable construction with a powerful output, all add up to a versatile light for any diving occasion. It's also 100 metres tested. 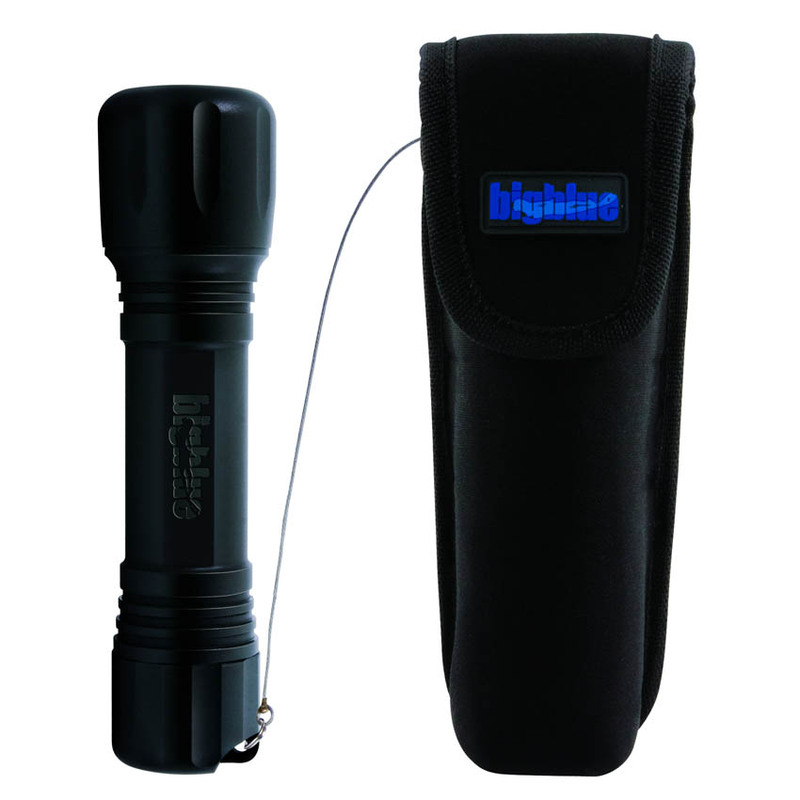 Bigblue CF-600-TEK rechargeable. 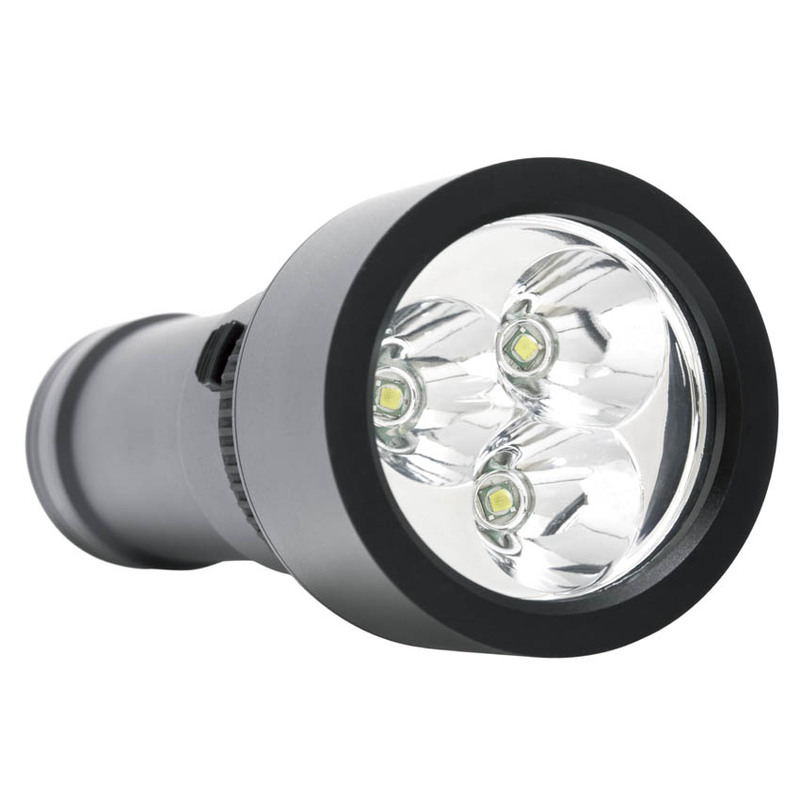 This latest advancement in the changeable focus series pumps out a steady 600 Lumens at output in ultrahigh intensity. 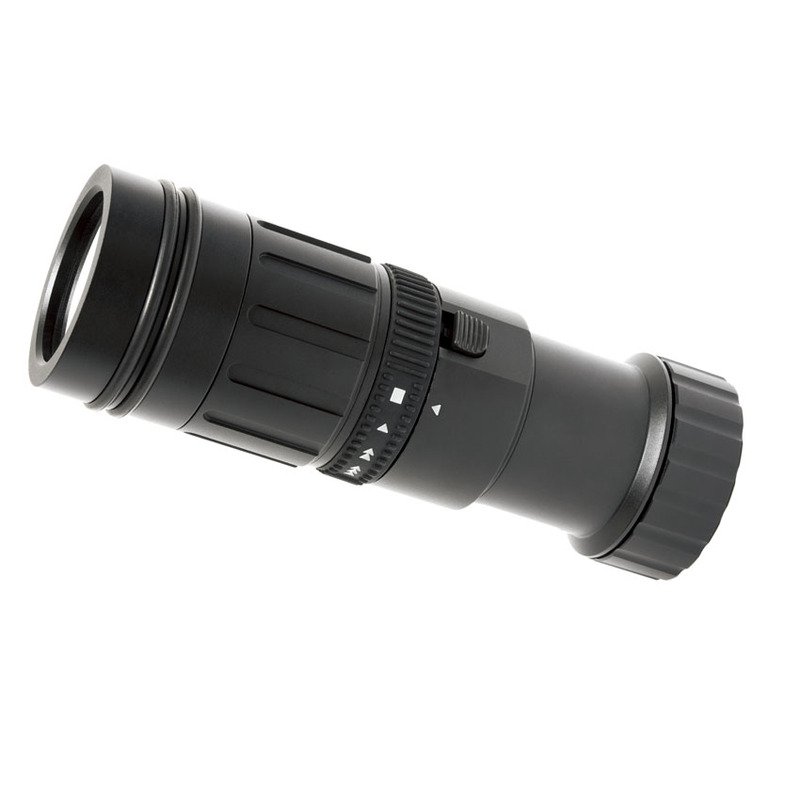 The changeable focus is from 8° to 28°, simply by turning the front lens(turning force increases with depth). At the narrowest beam, the concentration of light is hard to beat. It employs a Ni-MH rechargeable battery pack which can be quick charged with our Smart Quick Charger within 2 hours. It is operated by three levels magnetic switch in 25%, 50% and 100% output, allowing a stretched burn time from 3 hours to 12 hours, ideal for the demanding diving use. 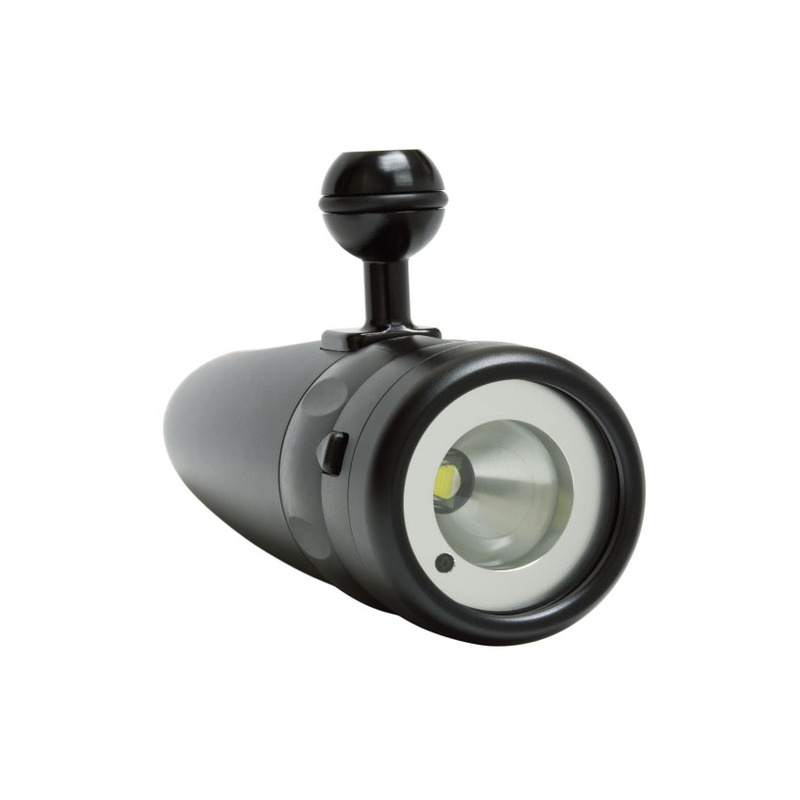 The Bigblue VL 1300 it is a self-contained, compact yet powerful all-purpose diving light best suited for video. 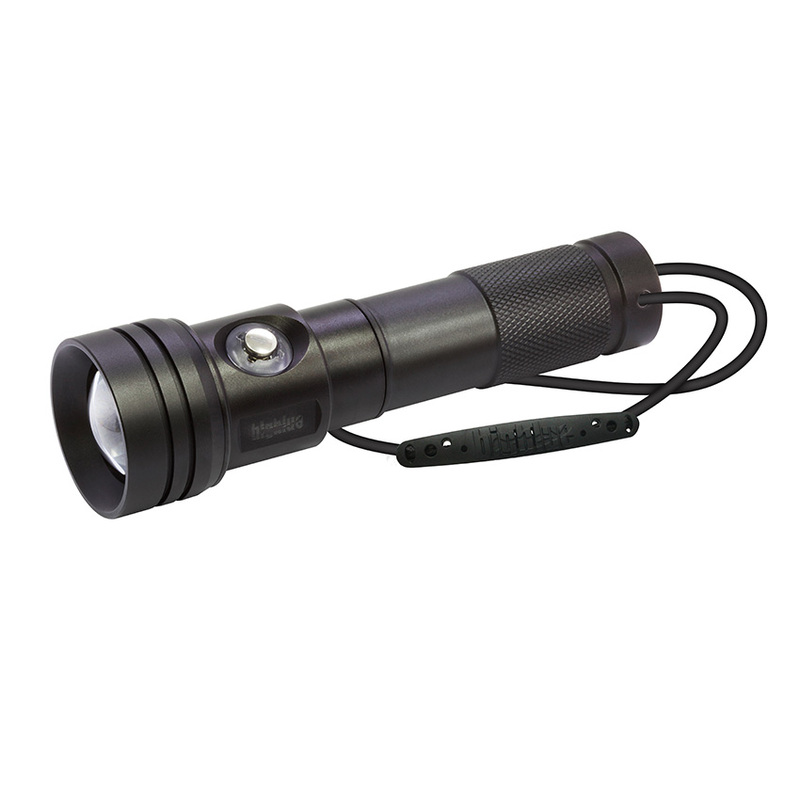 It boasts a stunning 1300 Lumens brightness from a single 30W LED chip, and offers 25%, 50% and 100% output levels to allow the user to enjoy burn time lasting from 1.4 hours to 6.5 hours. 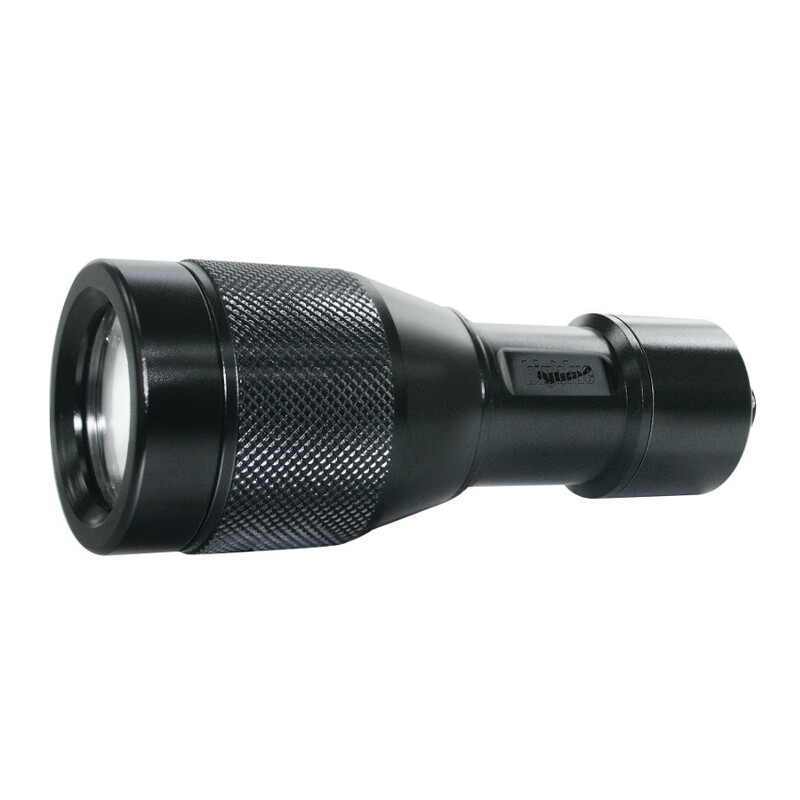 The VL 1300 is made of T6061 grade aluminum, it contains a replaceable Ni-MH rechargeable battery. You can recharge the battery with ease by opening the front lens. Light source 30W LED Module I mode = 325 Lm., Light output II mode = 650 Lm., III mode = 1300 Lm. Color temperature 6500K I mode (Lo=25%) = 6.5 hrs., Burn time II mode (Med=50%) = 3 hrs., III mode (Hi=100%) = 1.4 hrs. Goodman’s glove to be used with AL 1x5, AL Spotter and AL 1x5 AFO. Pouch can be used with AL 1x5, AL Spotter Neo and AL 1x5 AFO. comes complete with loops to attached to your BCD and lanyard retractor. Shooting images in the darkness of the cave environment can be challenging for even the most sensitive of camera autofocus systems which is where a decent focus (spotter) light comes in. 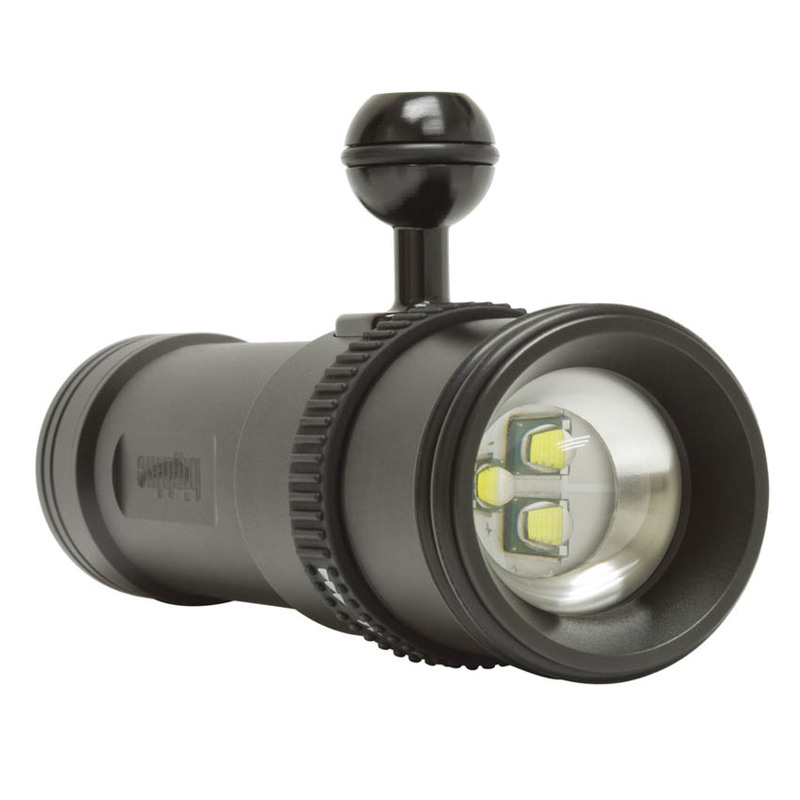 Recently I’ve been testing the Bigblue Al-250 AFO spotter light from Liquid Sports. Constructed of solid aluminium and rated to 100m, the Al-250 feels light a quality item – it’s reassuringly heavy and the ‘twist on/off’ mechanism is very smooth. It’s supplied with a YS mount so can be used with most camera systems with the appropriate mount adaptor. What really impressed me about the Al-250 is the quality of the light that it produces which is bright, even and nicely diffused from its 250 lumen CRE LED head. The light features a sensor which switches the focus light off when your strobes fire. Like all focus lights with this feature, this function works best when shooting macro in TTL mode as the strobes will produce a pre-flash. It does work in manual mode too but the lack of pre-flashes may cause the illumination from the focus light to appear in your shot under very rare circumstances. As it uses an LED head, the soft light and cool colour temperature of the Al-250 is close enough to modern strobes not to produce any discolouration. My only feedback on the Al-250 relates to the YS mount that is supplied with it. Whilst the light itself is of very solid construction, the YS mount isn’t quite up to the same standard. 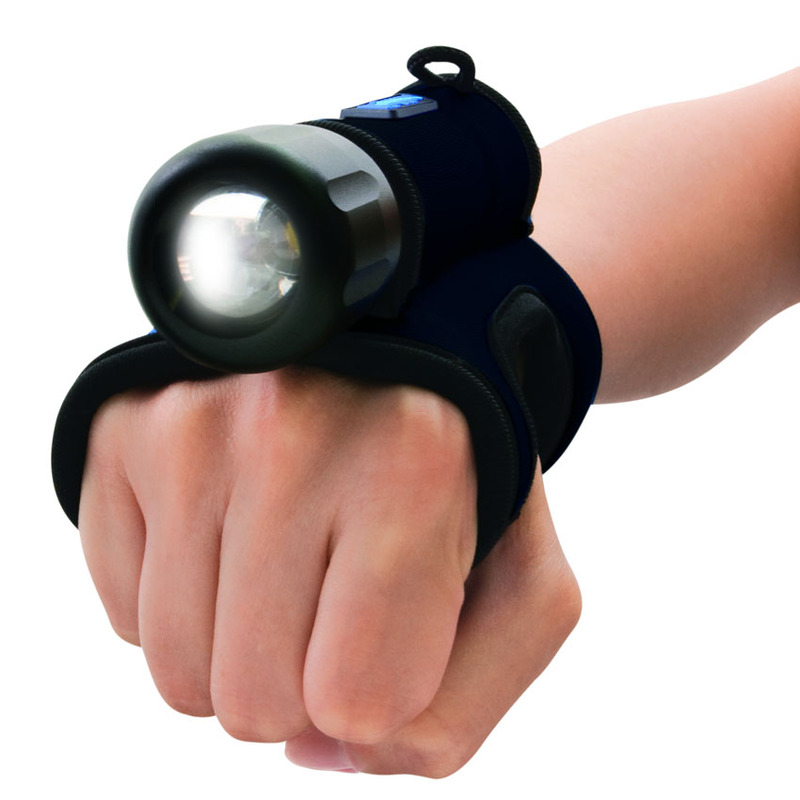 Personally I would have liked to have seen this made of aluminium too – as it is, you have to hold onto the torch with both hands to turn it on and off. 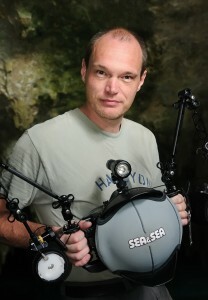 In conclusion, the Bigblue Al-250 is a quality item that I’d be more than happy to recommend to any underwater photographer. It’s solid, works well and produces a very pleasing, soft light that made focusing in the low-light conditions inside the caves of Mexico an absolute doddle. It’ll certainly be staying on my camera housing!